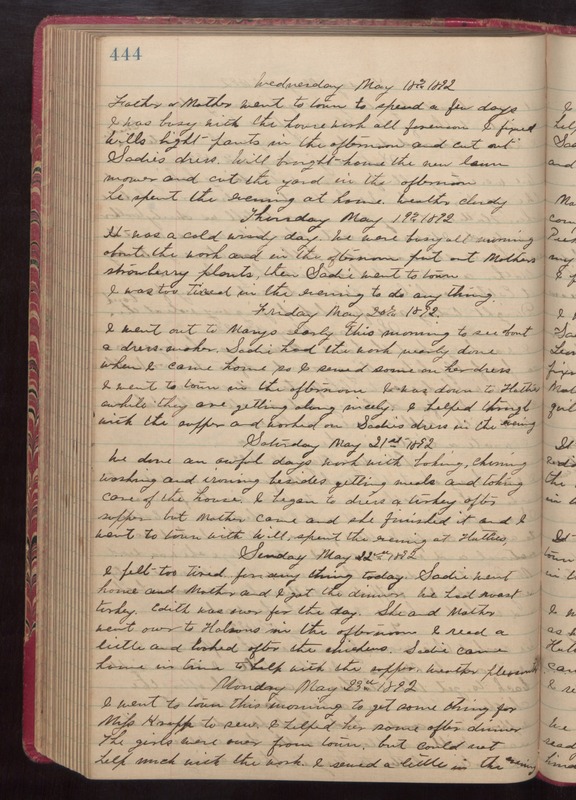 Wednesday May 18th 1892 Father & Mother went to town to spend a few days. I was busy with the housework all forenoon. I fixed Wills light pants in the afternoon and cut out Sadies dress. Will brought home the new lawn mower and cut the yard in the afternoon he spent the evening at home. Weather cloudy. Thursday May 19th 1892 It was a cold windy day. We were busy all morning about the work and in the afternoon put out Mothers strawberry plants, then Sadie went to town. I was too tired in the evening to do any thing. Friday May 20th 1892 I went out to Marys early this morning to see about a dress-maker. Sadie had the work nearly done when I came home so I sewed some on her dress. I went to town in the afternoon I was down to Hatties awhile they are getting along nicely. I helped through with the supper and worked on Sadies dress in the evening. Saturday May 21st 1892 We done an awful days work with baking, churning, washing and ironing besides getting meals and taking care of the house. I began to dress a turkey after supper but Mother came and she finished it and I went to town with Will, spent the evening at Hatties. Sunday May 22nd 1892 I felt too tired for any thing today. Sadie went home and Mother and I got the dinner. We had roast turkey. Edith was over for the day. She and Mother went over to Holsons in the afternoon. I read a little and looked after the chickens. Sadie came home in time to help with the supper. Weather pleasant. Monday May 23rd 1892 I went to town this morning to get some things for Mrs Knopp to sew. I helped her some after dinner. The girls were over from town, but could not help much with the work. I sewed a little in the evening.